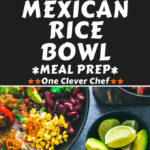 This Mexican Rice Bowl with chicken meal prep is “HMMMmmm”!! At least that’s what my 1-year-old little man had to say about it. I suppose what he meant is that it was surprisingly delicious for such a healthy dish! (Or something along those lines, I guess!). Ready in 30 minutes and very easy to make, this recipe is also perfect as a weeknight dinner for the whole family. It is gluten-free (as usual), dairy-free, egg-free, and nut-free. 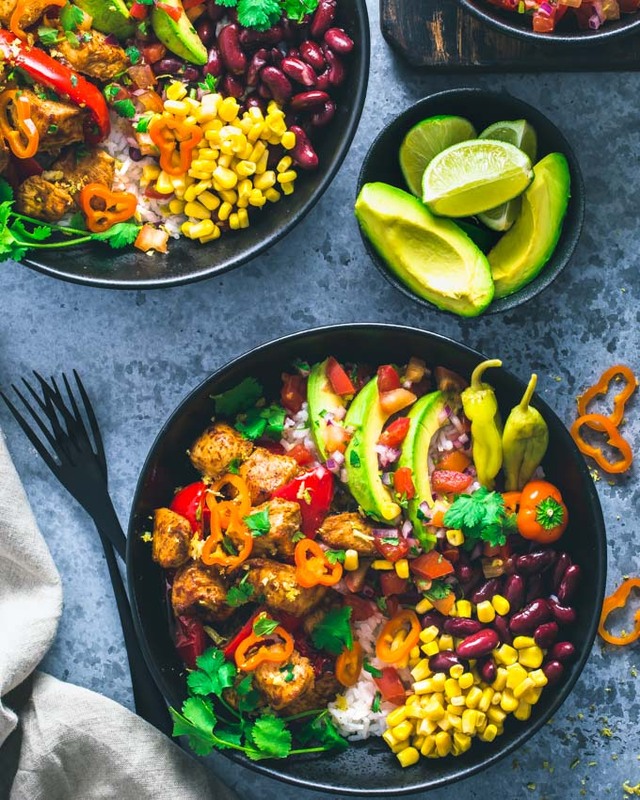 If you’ve been following me on this blog for a while, you’ll know that one of my recent recipes was a Burrito Bowl Meal Prep and if you’ve tried it, you’ll know how damn awesome that recipe was! Since it was so well received on the blog, I’ve decided to create something slightly similar. 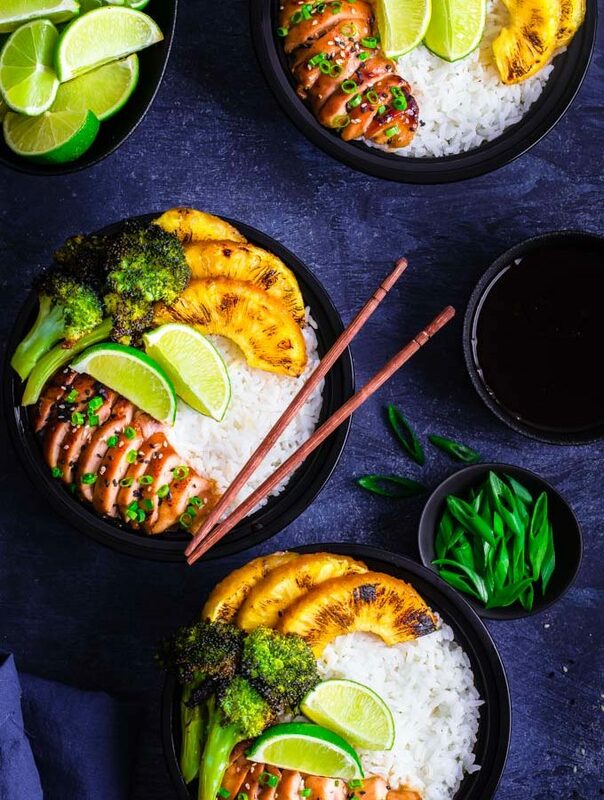 The biggest difference between those two recipes thought is that the base recipe for this one is more flavorful so it won’t require you to carry around any sauce or additional toppings if you don’t want to. Rice. Any type will work, although I always suggest opting for either Basmati or brown rice as their glycemic index is low. Chicken. 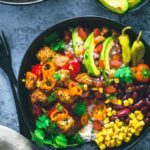 I am using boneless skinless chicken breasts for this recipe, but you could use chicken thighs instead. Black Beans. Or dark red kidney beans. Corn Kernels. Or cooked ears of corn if you want to go all fancy and stuff. Red onion. Or yellow. Red is sweeter/tastier. 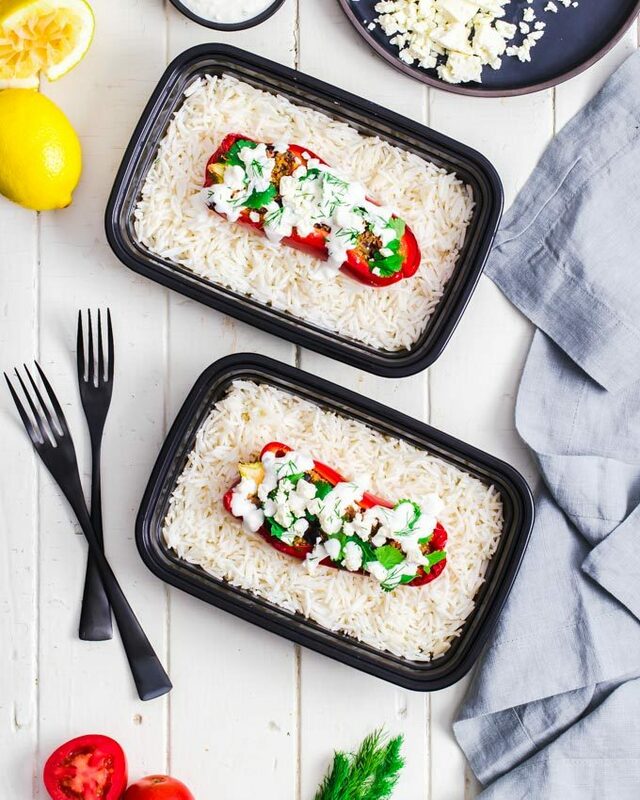 Bell Peppers. I used red, but any color will do. Avocados. To me, Mexican = avocados. Such a delicious, healthy and wonderful fruit. This ingredient is optional. Limes. Both for their juices and zest. God, I love this fruit! Olive oil. 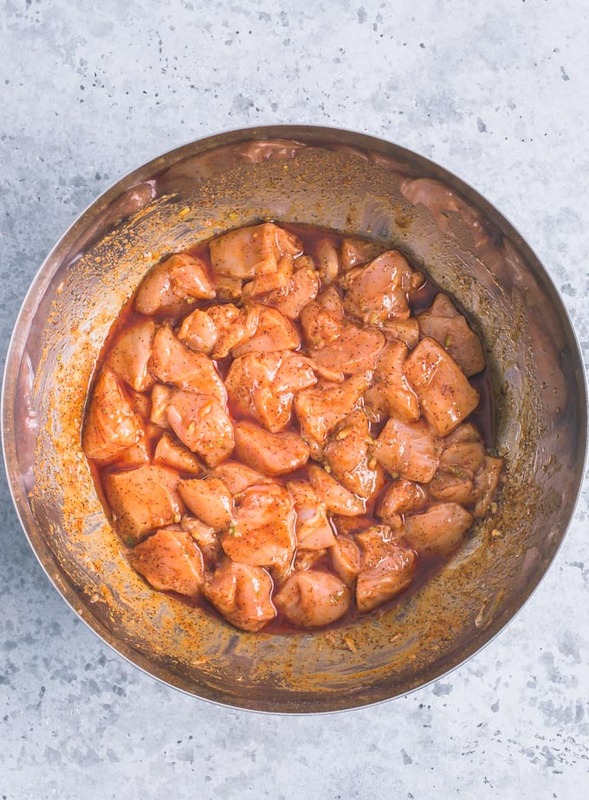 For the chicken marinade, you could use avocado oil instead. Maple Syrup. To add a little bit of sweetness to the marinade, optional. Garlic powder. Or fresh garlic. Chilli powder. For the marinade. Could use taco seasoning. Cumin powder. For the marinade. Could use taco seasoning. Small hot (or not!) peppers. As a topping, entirely optional. Cilantro. Used as a topping only here. Again, optional. 1. Preheat oven to 425F and line a large baking sheet with parchment paper. 2. Make the marinade. In a large mixing bowl, stir together olive oil, lime juice, lime zest, maple syrup, garlic powder, chili powder, and cumin powder. 3. Prepare the chicken. Cut the chicken breasts into 1-inch cubes. Place the chicken cubes into the marinade and slowly stir them until they are evenly coated. This step could be done up to 24 hours ahead of time for a more flavorful dish. Arrange the chicken cubes evenly on the baking sheet when ready to bake. 4. Prepare the bell peppers and onion. Slice the onion and bell peppers and place them on the baking sheet. Pour some olive oil and a tablespoon of taco seasoning on top of them and slowly flip and turn them until they are evenly coated (you could do this step in a bowl, too). 5. Bake the Chicken, peppers, and onion. Making sure the desired baking temperature is now attained, transfer the baking sheet to the oven. Bake for 20-25 minutes or until the internal temperature of the chicken cubes has reached at least 165F. 6. Meanwhile, prepare the rest of the ingredients. While the contents of the baking sheet are baking, make sure all ingredients needed for the bowls are ready. 7. Assemble. Scoop some rice on the bottom of the bowls then scoop some chicken, bell peppers and onion one side. Finally, scoop the rest of the bowl contents next to each other. 8. Toppings. Top with salsa and any other desired toppings. 9. How to store. This recipe can be stored in the refrigerator for up to 7 days. Do not cut avocados more than 24 hours in advance as they will turn brown over time. It is best to cut them when ready to eat or a few hours before eating. Ideally, place any additional toppings in a separate container. How to store. This dish can be kept in the refrigerator for up to 7 days in sealed containers. Store any additional toppings in a separate container or bag. Reheat before eating. 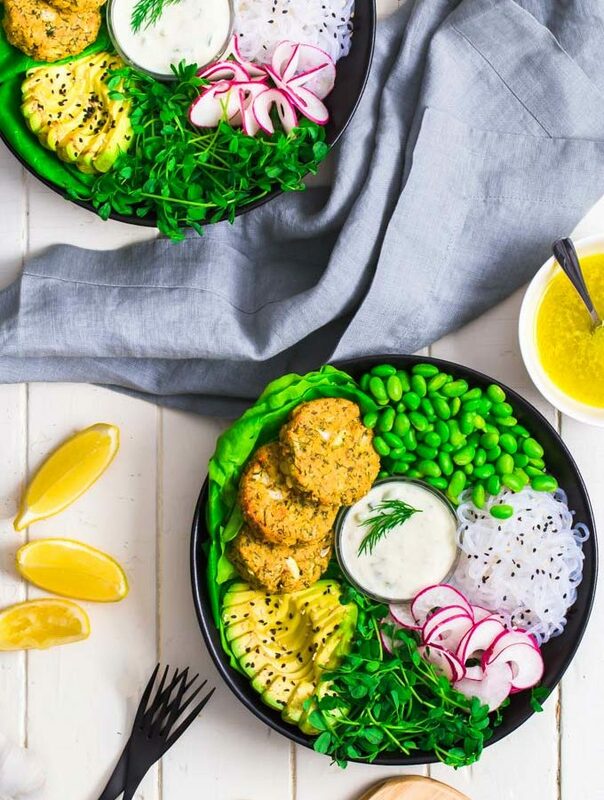 This is not a salad. This dish is not intended to be eaten cold. Avocados. As said above, either bring an avocado with you and cut it on the spot or cut it a few hours in advance. Do not cut a week’s worth of avocado cubes on a Sunday afternoon as they will turn brown over time. This ingredient is also optional and could be replaced with guacamole. Additional toppings. Ideally, place any additional toppings in a separate container and top your dish after reheating. 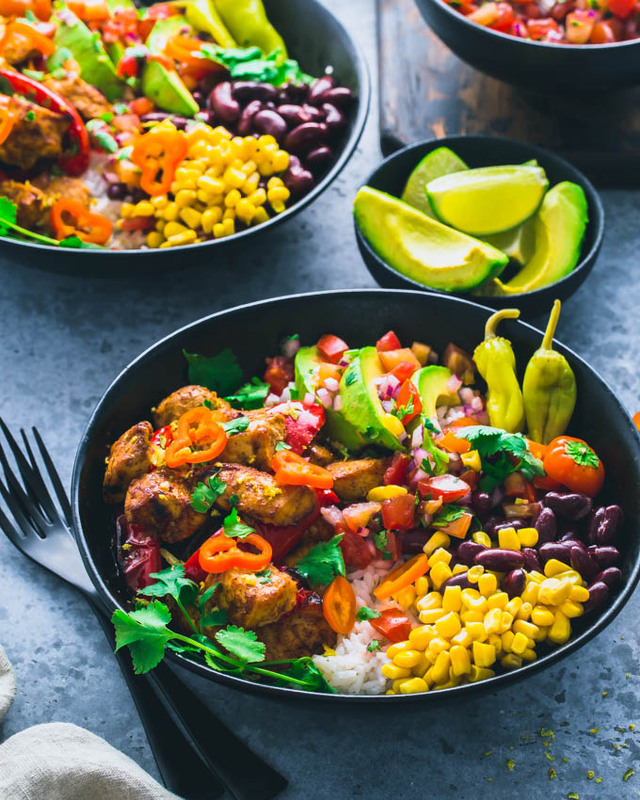 This Mexican Rice Bowl is flavorful, easy to make and so healthy. 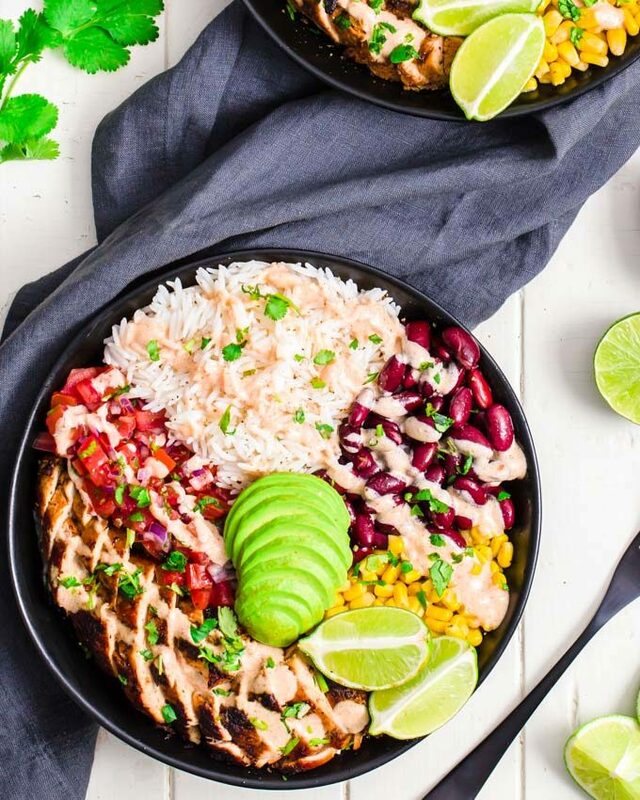 Made with traditional Mexican ingredients, this rice bowl is fresh and a little bit spicy. Preheat oven to 425F and line a large baking sheet with parchment paper. Cook the rice. Combine 1 cup rice, 2 cups water, and 1/2 tsp sea salt in a medium saucepan and bring to a boil. When it does, turn down the heat to minimum, cover and simmer for 15 minutes or until all of the water is absorbed. When ready, fluff the rice using a fork and set aside. Preparing the Chicken. 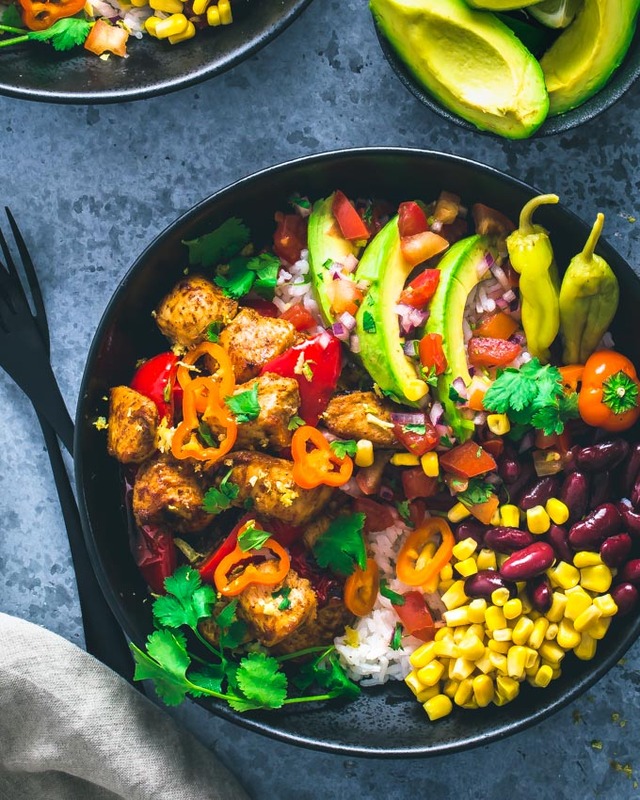 In a large mixing bowl, stir together 1/3 cup olive oil, the juice and zest of a lime, 1 tbsp maple syrup, 1 tsp garlic powder, 1 tsp cumin powder, and 1 tsp chili powder. Then, cut the chicken breasts into 1-inch cubes and incorporate them into the marinade, slowly flipping and turning them until evenly coated. (Note: This step could be done up to 24 hours ahead of time to allow the chicken to marinate.) 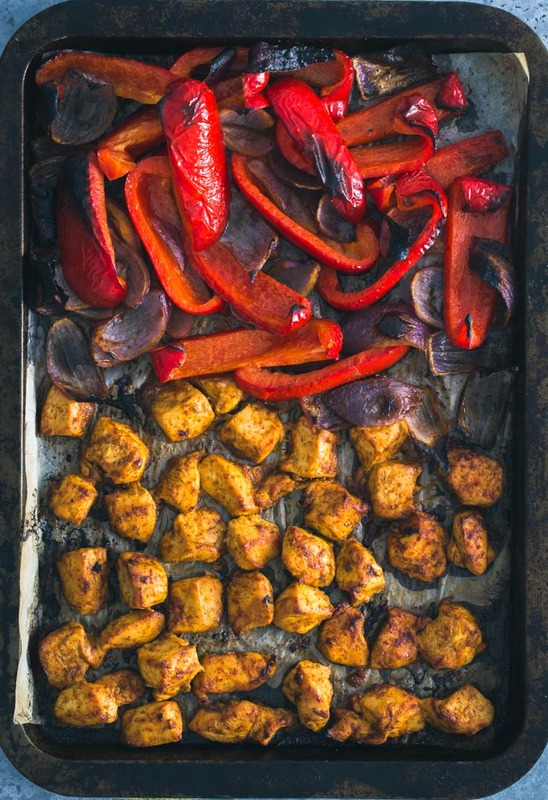 Arrange the chicken cubes evenly on one side of the baking sheet when ready to bake. Peppers and Onions. Slice the bell peppers and onion and place them on the other side of the baking sheet. Then, pour 2 tbsp olive oil and 1 tbsp taco seasoning on top of them and carefully flip and turn them until evenly coated. Baking. 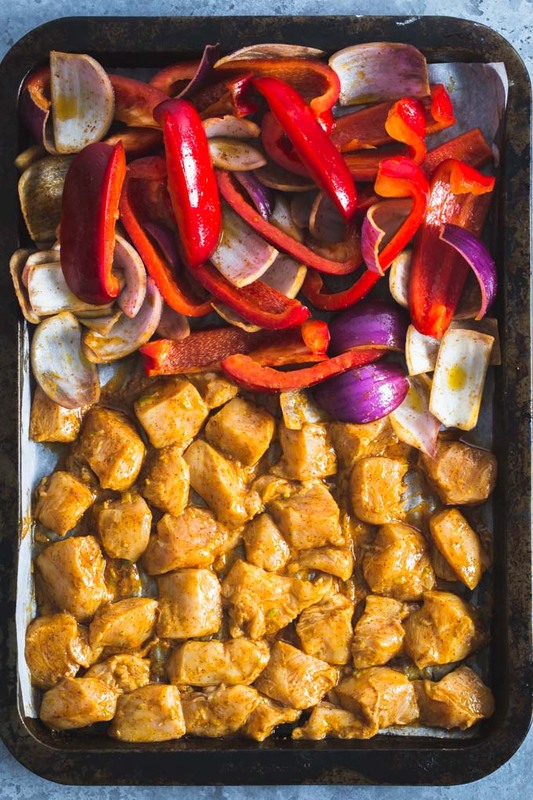 Bake the chicken, bell peppers and onion for 20-25 minutes or until the internal temperature of the chicken cubes reaches 165F. Preparing the bowl contents. Meanwhile, make sure every other ingredient is ready. Assemble the bowls. Scoop some rice on the bottom of the bowls, then top with chicken, bell peppers and onions on one side. Scoop the rest of the bowl ingredients next to each other. Toppings. Wait until ready to serve, then top with salsa and any other desired toppings. How to store. Can be kept in the refrigerator for up to 7 days in a sealed container. Store toppings separately. * Chili powder and cumin powder in the chicken marinade could be replaced with 1 tbsp taco seasoning. Nutrition Information was calculated for 4 servings, without any additional toppings (other than fresh salsa).